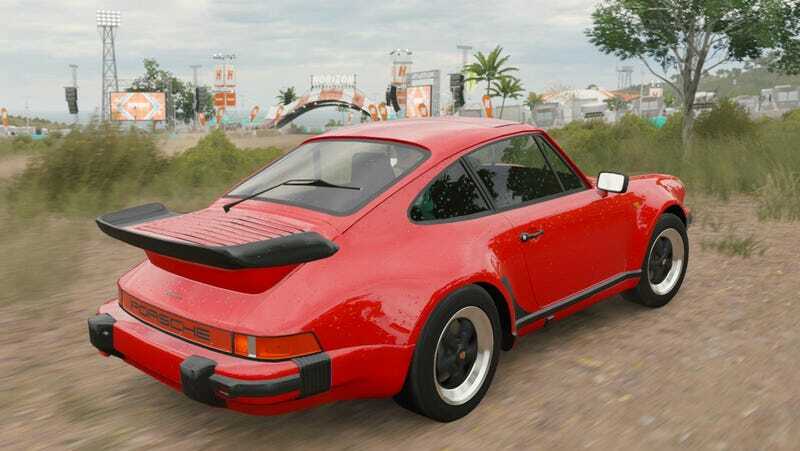 One of many unreleased Porsche vehicles found in the accidentally released dev version of Forza Horizon 3, via Imgur. Players downloading yesterday’s Forza Horizon 3 update on PC got a bit more than they bargained for, in the form of a 53 GB unencrypted developer build of the game, revealing a whole slew of unannounced vehicles that also screwed up players’ save files. The Forza Horizon 3 version ending with .37.2 went live on the Windows store yesterday, prompting owners to download the entire game all over again in order to play, which was fishy enough on its own. Once players downloaded the build, they discovered screens laced with debug text and a cars folder much larger than normal. Image via the Forza forums. Note the debug info in the bottom right. There’s good news and bad news. The good news depends on how many of the cars discovered in the developer build of the game by folks on NeoGAF and Reddit actually wind up in the game. The full list includes a wide variety of vehicles, from the 1932 Ford De-Luxe Three Window Coupe to the 2016 Lotus 3-Eleven. The list also includes 18 different Porsche vehicles, suggesting we’ll be seeing a Porsche expansion of some sort in the near future, similar to the ones we’ve seen in other Forza titles. The bad news is that players who downloaded the unintentional update and started a new save file for it found themselves with corrupted save files, as detailed by community manager Brian Ekberg on the Forza forums.